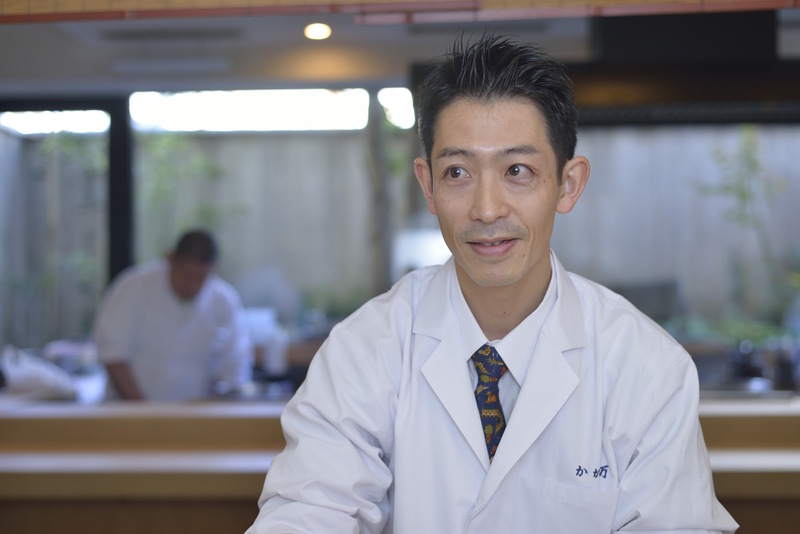 His dream is to bring Japanese cuisine to the world. 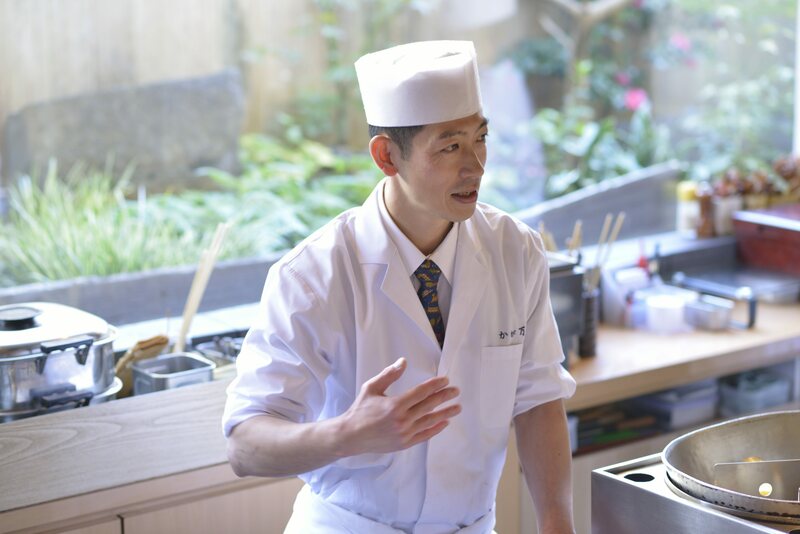 The bilingual bearer of the Naniwa Culinary Arts relates his harsh experiences to value. In Kitashinchi, Osaka, where fine dining restaurants line the streets, you'll find the oden specialty restaurant, Man'u. It is a subsidiary of Kagaman, a Japanese cuisine restaurant boasting over 35 years of history. Man'u offers oden made with the training of a traditional Japanese restaurant, full of techniques from Japanese cuisine, and without compromising in the slightest on any of the ingredients. It is a well-known restaurant that has even been published in the Michelin Guide. 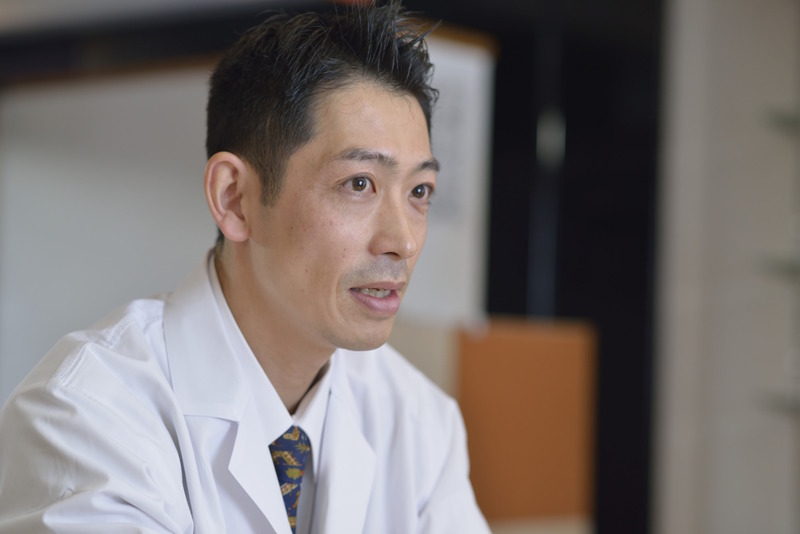 Having trained at such a place as Kagaman, and now working as the manager at Man'u Bekkan, Toshihiro Yoshida allowed us to interview him regarding his standards as a chef and his thoughts about staff members. Point1. Various experiences while in training, including those outside of cooking, become useful assets in one's future. Point2. Don't figure it out with your head, learn it with your body. By doing so, you'll be able to work in the cooking area when time is of the essence. Point3. The important thing for a team is that everyone shares and understands some important things. What was your impetus for entering this industry? I entered this industry at the age of 23, after graduating from university. Actually, I had received an informal offer from another company, but… I declined that job, and decided to walk the culinary path. Because of my parents’ work, I lived in England from age 5 to 10, and then I lived in Belgium from age 15 to 20. After that, I went to university in Japan, as is normal. I did some job hunting, but somewhere in my heart, I felt like I wanted to live in Europe again. My father’s company relocated him to Japan, but I almost wanted to stay in Europe, as it was. I thought it would be easier to live abroad if I acquired a trade. With that in mind, I decided to dive into the world of cooking. 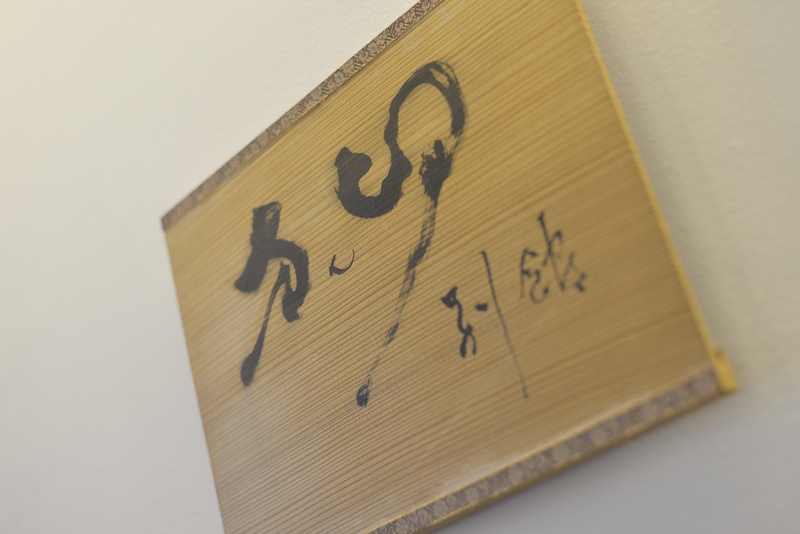 Did you think about entering the world of Japanese cuisine from the start? With that, I went to the owner of a French restaurant where I worked part time when I was a student. I consulted with him, saying, “Actually, I want to go down the path of Japanese cuisine.” He introduced me to “a good restaurant in Osaka.” That’s when I joined Kagaman. It’s the mother restaurant of Man’u Bekkan, where I currently work as the manager. Various experiences while in training, including those outside of cooking, become useful assets in one’s future. How was it when you first entered the world of cuisine? Actually, at Kagaman, one doesn’t suddenly cook right from the start. First you have to help behind the counter, or be in charge of the floor service. At Kagaman, a lot of value is placed on the importance of interacting with customers. Only when you make food does that experience really be useful. Even if you only work behind the scenes, and suddenly start to cook, you can’t really imagine things like how customers think. But if you have had contact with customers, you become able to do so. In the roughly seven years that I was at the main branch, I was gradually given jobs like arranging the food. Also, aside from that, I was in charge of managing the dishes. I got to do all the various things related to the dishes, like preparing the dishes in response to the season or the menu, so… The days in which I might not have even been able to sleep for two hours after work was finished… However, thinking about it now, this type of experience outside of cooking has also come in handy, even in the management of a restaurant. You really had a long road by the time you started making food, huh! How did you feel when you were first entrusted with making food? It was around the fifth year after I had joined the company that I was put in charge of making food. Of course, I was shaking. The more I thought, “I have to do it properly,” the more nervous I became, and I couldn’t do it right. Especially now, it’s become an environment where I will help young people, but back then, your superiors wouldn’t tell you how to do anything, even if you asked. [laughs] I think it has really become different in that regard now. Teaching styles have changed a lot with the times, haven’t they! Who was a mentor to you? My mentor was, of course, the owner of Kagaman, Hiro Saka. He’s 73 years old now, and he rarely goes into the kitchens, so we don’t get to receive his guidance directly anymore. However, he is always observing each person, thinking, “How can I make use of this individual?” I was able to continue working, particularly because he looked at me like that. The current Kagaman group consists of 8 restaurants in Kitashinchi. They were established by the owner with the idea to “set them up in a sphere where his eyes could reach.” Even now, he goes around to every restaurant, one by one. But the moment he comes in, the atmosphere changes, so you know he’s there. You built a really strong master-pupil relationship, didn’t you! Do you have any other recipes for success that you learned while overcoming the difficulties of paying your dues? I think one thing would be to ask oneself, “First of all, what kind of goal do I have?” I think for everyone, it’s, “In the end, I want to have my own restaurant,” so… If you have strong feelings about your dreams, you can always do your best, right? I continue to have the dream of someday opening a restaurant in Europe. Becoming independent means doing everything yourself. You have to clean the restaurant before opening, purify the entrance by carefully sprinkling water, bring in senior staff, manage the dishes… You can’t run a restaurant just by cooking. No matter how tough they are, all of your experiences while paying your dues are put to use only when you open your own restaurant. For that reason, too, I think someone’s time paying their dues has a lot of significance, but I feel that not many people can completely understand that and keep at it.